Simply Amazing vacation? 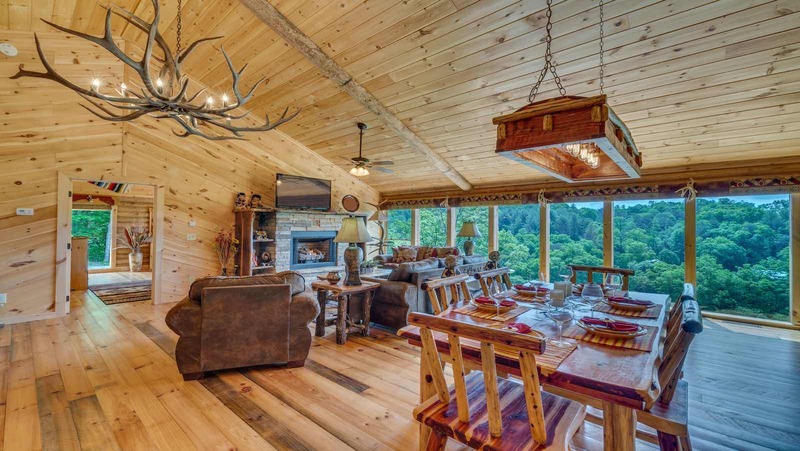 You’ll feel as though you are taking a trip in to the West with this luxurious upscale custom designed log home. 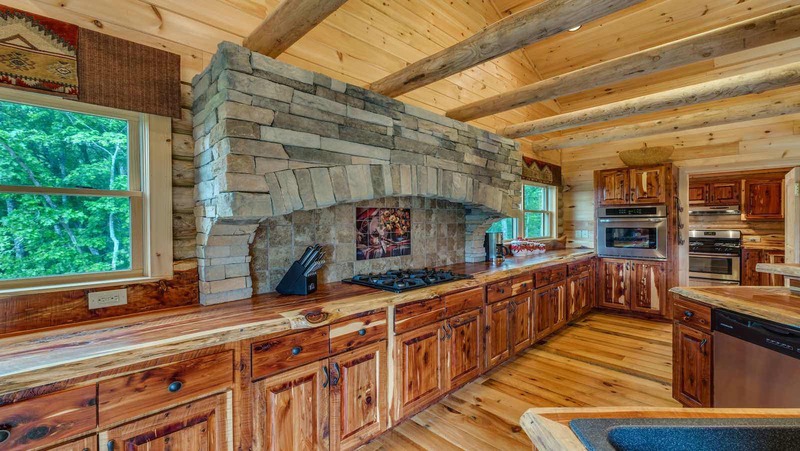 The finest furnishings, highest quality stone & rock, and priceless décor compliment this extraordinary cabin creation, along with its own unique private hiking trail to the famously pristine Toccoa River. Drive up the quiet, gentle road to the cabin, as the pavement ends and a lovely gravel road weaves along the hillside and a small sparkling stream rushes past you. Arrive to a magnificent exposed log structure, with covered parking under large reclaimed tree trunks and the gorgeous extra-large brick outdoor patio area centered around a brick firepit. Enter the antler adorned large iron and oak front door, to soaring ceilings, large timber beams, and the most unique collection of furniture & décor. To your right, a powder room with a tree trunk and raw stone sink. To your left, the log slab stairway to the game room level. In front of you, floor to ceiling windows overlooking the mountains and the gorgeous Toccoa River below. The square cut stone gas log fire place is accompanied by beautiful leather and canvas sofa and chair and topped with a large flat screen television. You’ll find the handmade cedar table & chairs between the sitting area and the magnificent kitchen. Exposed round logs frame the spacious kitchen pergola-style, with plenty of room for preparing meals. This kitchen has cedar countertops, a custom designed square stone cut stove & unique Native American backsplash, a breakfast bar with 4 handmade log chairs. Just behind the swinging door on the kitchens right is a roomy butler’s pantry with a 2nd stove and sink. Step out of the butler’s pantry onto the charming deck over looking the mountains and river. Here you could listen to the birds sing, enjoy a meal on the patio table, plan your day in Blue Ridge, grill some burgers, or just relax and soak up the sun! Ready to see the master suite? Step back inside and head across the great room to the master bedroom. 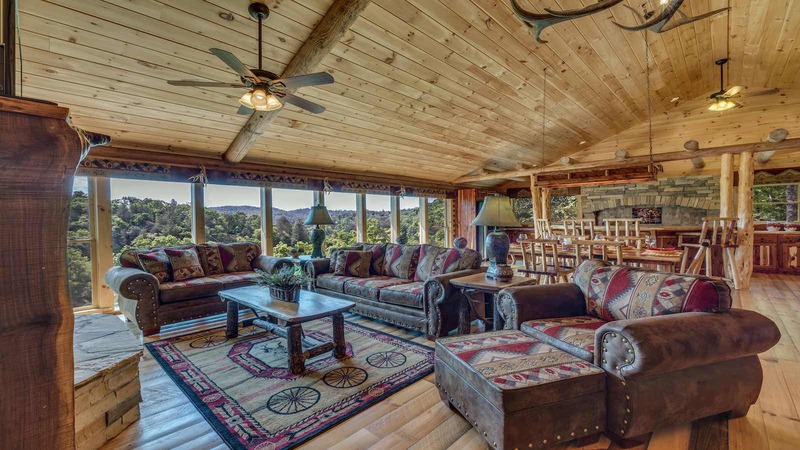 A large log bed, flat screen television and an interesting Native American scene await you. Unique artifacts invoke your imagination to wonder possible stories of long ago, as the space above is occupied by lovely models and figurines. Attached to this room is the master bath, complete with gorgeous double vanity quartz sinks and the striking tile shower. Now, head down the log slab stairway to the pool room. Here you will find a custom designed pool table with cedar tree trunks supporting it; these are aged over 60 years. This room is great for entertaining; it has several log chairs for seating, a small wet bar, and large flat screen television. A white pine desk is also available here, should you need to catch up on some work or just take care of a couple things while you're here vacationing. This level will have the other two bed rooms and bath rooms. Both bed rooms will have beautiful king size log beds, rustic log slab counter tops and flat screen televisions. The hot tub is just outside on the concrete patio area, inside a screened in porch for added privacy. Get ready to take a hike! Simply Amazing is more of an estate than just a cabin; it has it's own private hiking trail down the mountainside to the PERFECT river frontage! The hike is about a 15 – 20 minute trek down to the river and is marked so you can follow it easily. 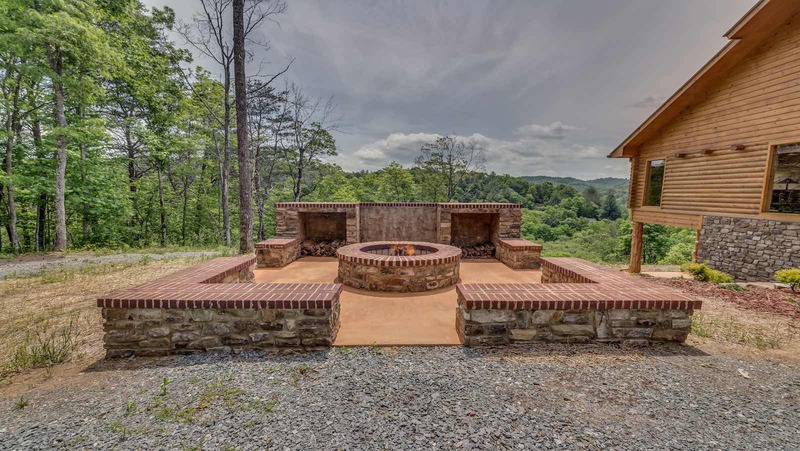 Wind down the trail, and cross the circa 1910 Blue Ridge Rail Road tracks to a flat, spacious spot that could not be more ideal for picnics, star-gazing, proposals, celebrations, swimming, fishing, family photos, etc! After a day at the river, hike back up to the cabin and relax in the hot tub while enjoying the mountains… You’ll already be planning your next trip back! Trust us, this place is Simply Amazing.